Samsung CM1929 1850w Heavy Duty Programmable Touch Control Commercial Microwave, featuring five power levels for greater cooking versatility. 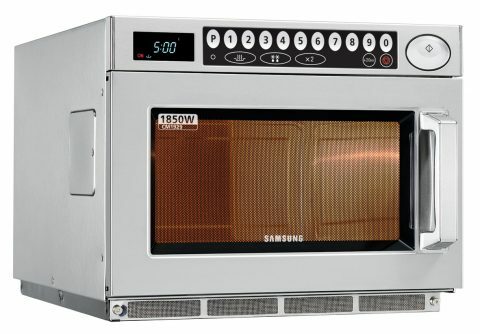 The Samsung CM1929 commercial microwave oven delivers heavy duty performance, while remaining exceptionally easy to operate. Efficient, with dual magnetron top feeding distribution and 26 litre 2/3 Gastronorm cooking area, you have a device that can handle even the biggest of tasks. Suitable for busy catering locations such as pubs, resturants and cafes, this stainless steel commercial microwave is stackable to given even larger capacity options to your catering location.